The SAT, or the SAT Reasoning Test, is a standardized test for college admissions in the United States. It consists of three subjects (Critical Reading, Mathematics, and Writing). Each subject is scored from 200 to 800. The combined test score ranges from 600 to 2400. 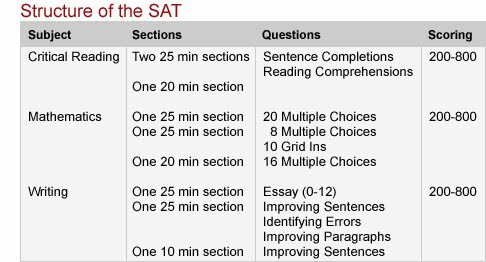 The SAT is comprised of 10 sections, 3 sections for each subject and an experimental section which is not counted towards the score. The SAT is administered 7 times a year, in January, March/April, May, June, October, November, and December. The SAT tests students comprehensive knowledge in vocabulary, reading comprehension skills, grammar, and mathematical skills including algebra and geometry.